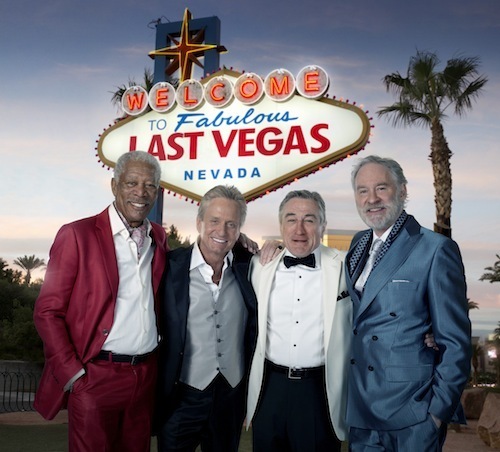 Check Out the First Image from ‘Last Vegas’!!! Remember, we reported a while back that Morgan Freeman, Kevin Kline, Robert De Niro, and Michael Douglas would be starring in a ‘Hangover’ type of film? Well, here is the first image of that film titled ‘Last Vegas’, which has all four gentleman in nice clothes in Sin City. The film will be released around Christmas time next year and co-stars Mary Steenburgen, Jerry Ferrara, Romany Maclo, and Roger Bart. Jon Turteltaub is directing a script from Dan Fogelman. ‘Last Vegas’ is a comedy about four old friends who decide to throw a Las Vegas bachelor party for the only one of them who has remained single. So basically, this is ‘Space Cowboys’, but rather than venturing into space, it’s a bachelor party in Vegas. Could be good. Morgan Freeman Joins ‘Last Vegas’!!! Robert De Niro and Michael Douglas To Team Up For ‘Hangover’ type Comedy?!?!? Eli Roth Will Open “Scary as Hell” Haunted House labeled ‘The Goretorium’ in Las Vegas!!! This entry was posted on Monday, November 5th, 2012 at 2:19 pm	and is filed under Film, News. You can follow any responses to this entry through the RSS 2.0 feed. You can skip to the end and leave a response. Pinging is currently not allowed. « Guillermo Del Toro Making a Epic ‘Avengers’ Like Movie!?! ?